Do you remember when I took a small break from flowers and make this bracelet? 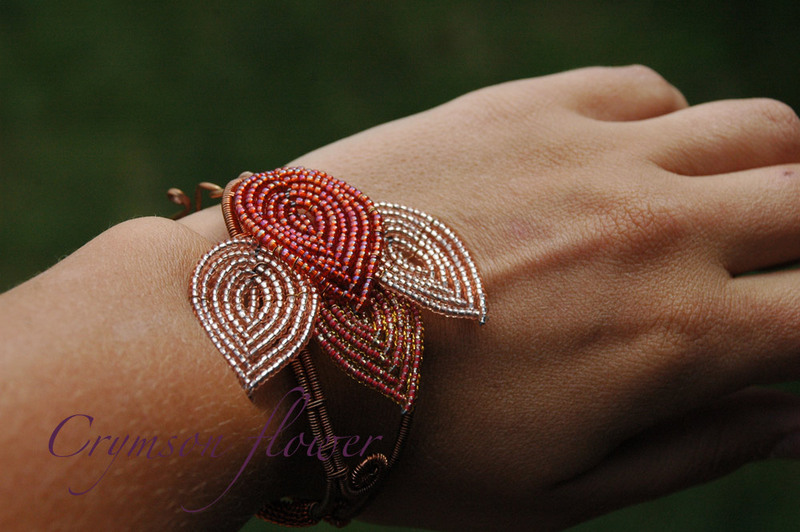 Just a few short days after making that bracelet I made this one. I love this bracelet. It's definitely a prototype and I have a few kinks to work out. 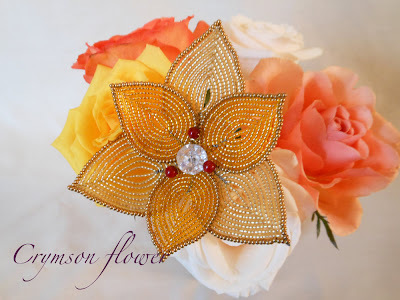 But I love incorporating the french beaded flower technique into a piece of jewelry and yet it's still not a flower on your wrist. 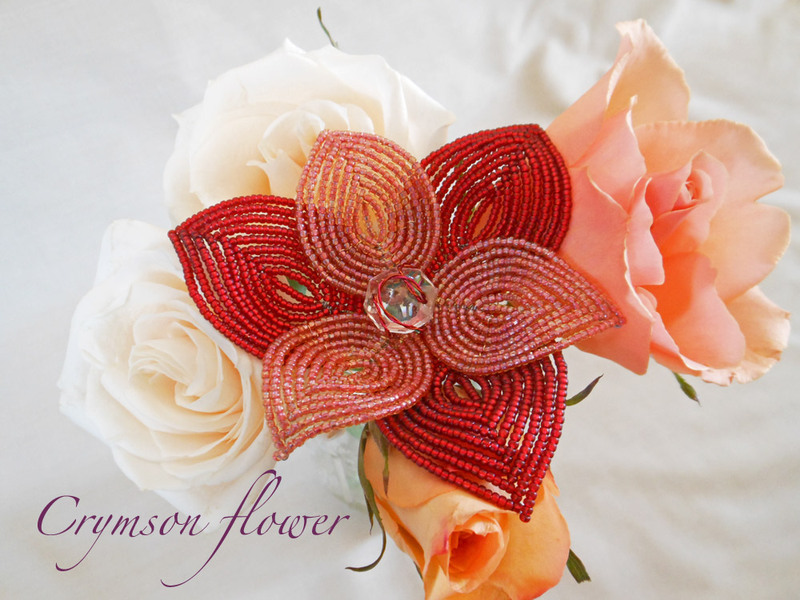 It doesn't look or feel like a gaudy corsage which is a big fear of bringing my beaded flowers into jewelry. 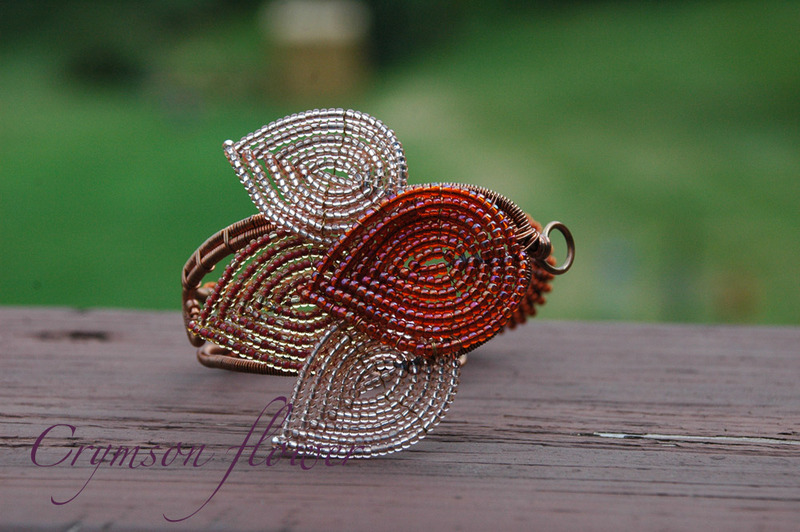 I also feel like if I'm going to start making jewelry of any kind it should be jewelry I would wear and love. This is it. Now the other bracelet is too but this one just screams me. My style, my colors. It has a glorious weight to it with all the copper, steel, and glass. The clasp is actually on the side of the wrist which I hadn't seen before but am enjoying. I wore it at all my shows this summer and it didn't catch on anything. Not my clothes or even my hair. The petals didn't bend back or become loose which was a big test for me. I need to have my jewelry sturdy. It has to pass the Amy brutality test! And I had a lot of feed back on this piece. Lots of people were excited about it and wanted to know when I'd have them available for sale. Which sort of blows my mind b/c this piece is so my style. I really never thought anyone would like my style. This pic shows my favorite part of the bracelet. I love the top, but it's this curve here that really truly makes me happy. And inspires new ideas for future bracelets. 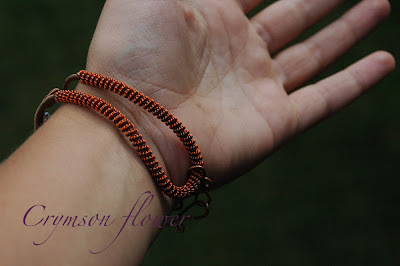 This week I've had a lot of thoughts on bracelets and have figured out my game plan. I plan to finish my Day of the Dead project this week. Then I have a donation for a charity I need to get together and complete, but that won't take long at all. Then I'm going to sit down and really work on bracelets. I want to fix the kinks, make a few ready to sell, and maybe even design a new one or two. I'm excited. And really can't wait to see what comes next. It's a mad dash to attempt to finish this fun project for the exhibition. The deadline for entries is MONDAY! The pictures so my progress so far as of Saturday afternoon. I worked on it Saturday evening and Sunday too so I have a lot more done. And I'm not even going to try and be modest about this project. I LOVE IT. It's creepy and fun, bright and dark, sparkly and dull. 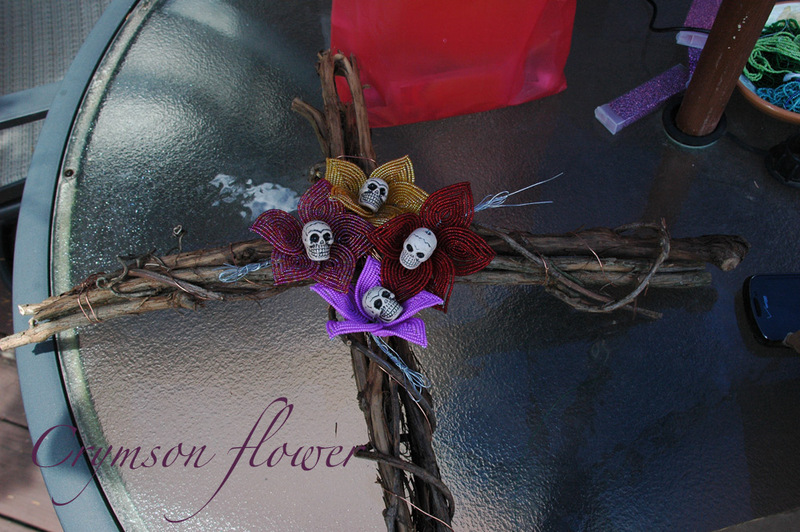 I will have teal and blue flowers trailing up the arms of the handmade from found grape vine cross. Teal flowers are made, blue ones are still in the works. I also need to make leaves. Lace everything. Complete centers. Assemble everything and photography it by Monday. It's my challenge and I'm going to try my hardest to get it in. What do you think? Would you hang this on your door around Halloween? 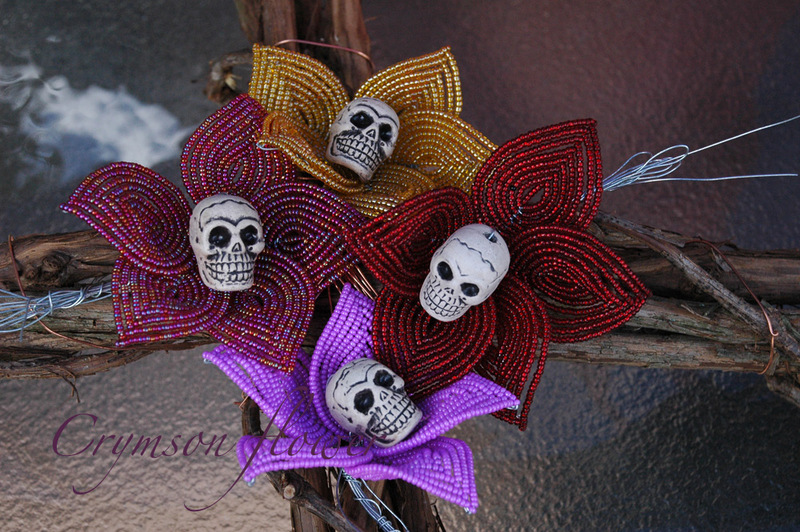 Or only after Halloween for the official Day of the Dead? 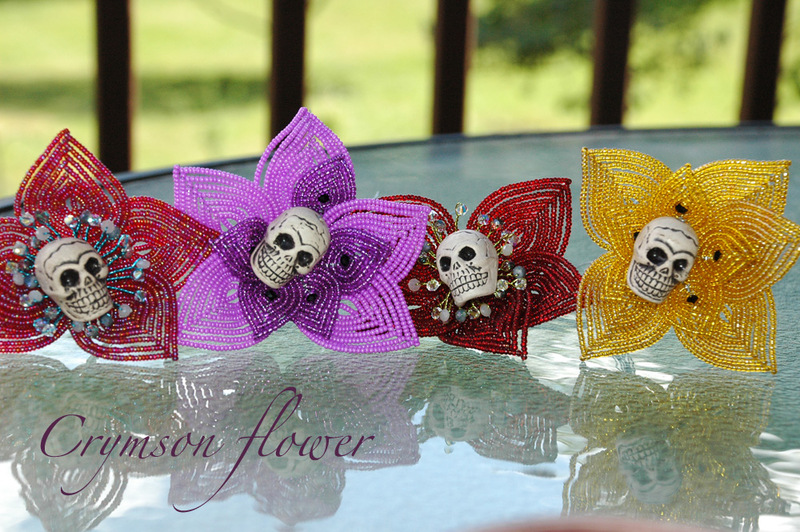 I kinda even love the skull flowers at the top individually. 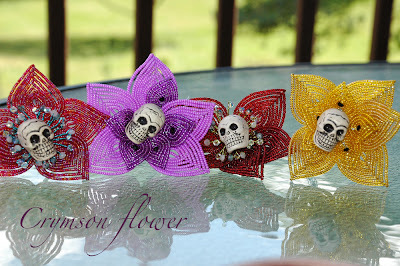 I'm contacting the seller of the skulls to see if they have more in stock for some potential Halloween themed flowers. Well I've now completed almost all of the art show's I've committed to this summer. I have one more Artists on the Boardwalk show in August. I've learned a lot this summer. I learned that I can be successful selling at shows. I learned that I'll never feel like I have a large enough inventory. I've learned that despite my natural inclination to be shy about my work I can indeed talk about it with people and sound professional and sell. That was quite an experience for me and gave me lots of confidence. It was almost an out of body experience to hear myself talking about what inspires me and when and why I started creating flowers and where I'd like to go with them in the future. Sunday's art show at the Mackinaw Valley Vineyard was a fun laid backwatch her talking about her work. I came away from the show profitable and happy. I sold a mixture of lilies and wine charms, and pendants. Lots more people were there this year than back when I did it in 2009. And the people were looking at the art a lot more too. The weather was pretty perfect, cooler than I thought it would be and the rain held off until we were packed up and driving away. It was fun to do a show w/ Mom and watch her talk about her work. Now I find myself in a major crossroads. Not just deciding to go between two directions but more like a 5 way intersection and each road needs to be explored. I'm more or less having problems deciding where to start. I have some major reorganization projects that need to be tackled. Some fall and winter projects that should be started. Web development decisions that need to be made. New ideas in jewelry and flowers to develop. We have a vacation coming up that I can't wait to go on. We're headed to Hayward Wisconsin for some camping and relaxation. It'll be cool and pretty and relaxing. Just what a busy summer requires. But that's still two weeks away. Today I'm taking care of a barfy toddler and while he naps exploring my next move in the beadverse. If you follow me on Facebook you've already seen these pics. I had a little countdown to tomorrow's big show. If you haven't heard I'll be at the Mackinaw Valley Vineyard's Art and Wine Festival. It goes from 12-6. It's a family friendly event with kid's activities, live music, art, and lots of wine. I finished all the flowers and wine charms that I started a couple weeks ago. Not as many as I would have liked but such is life. I'm excited for this show. It also marks the end of all my new shows so far for the year. I still have the Junction City shows, but they are small and I have a routine down for those now. I'm excited that after this show I can sit for a minute and think about what's next. I have lots of thoughts and ideas but they are scrambled in my brain. As you can tell I haven't been very great at balancing my Internet presence with doing shows. I'd like to find a Christmas show to do. There is one in February I'd like to apply to. And I'm getting a real website. So I need to figure out the details that go with that. On top of those thoughts are what's going on next creatively. 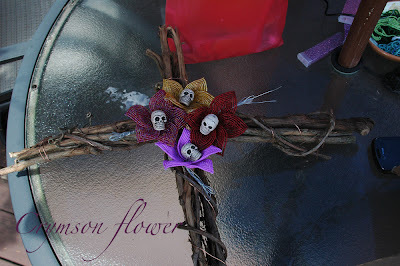 I have some great fall and winter wreath ideas. I want to experiment with some flower ideas. 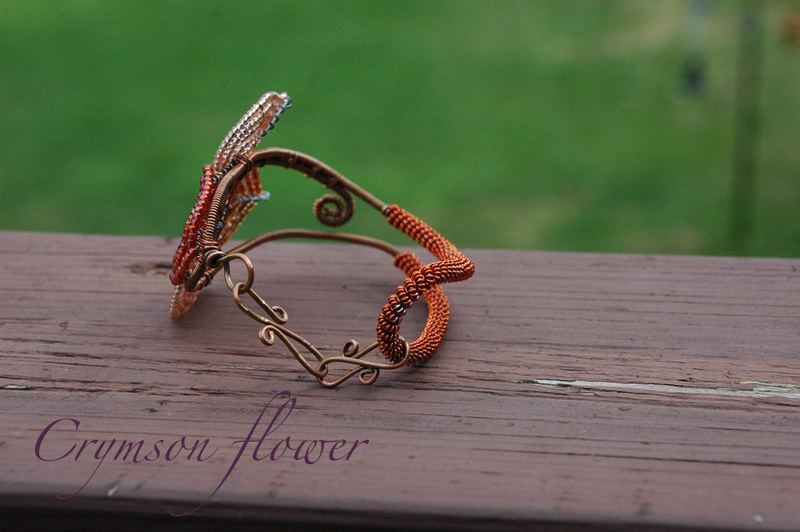 And explore more wire work and bracelets. The rest of this year will be busy and filled with exciting things that I can't wait to share with everyone. 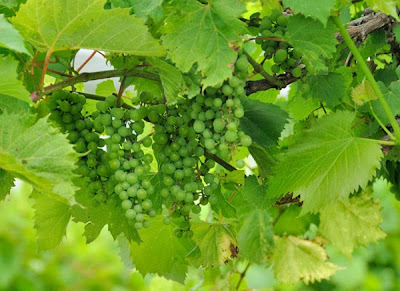 Until then if you're local I hope to see you at the vineyard! I have a traveling studio. It goes where I go. It has it's perks, in that I can use my deck as a studio. 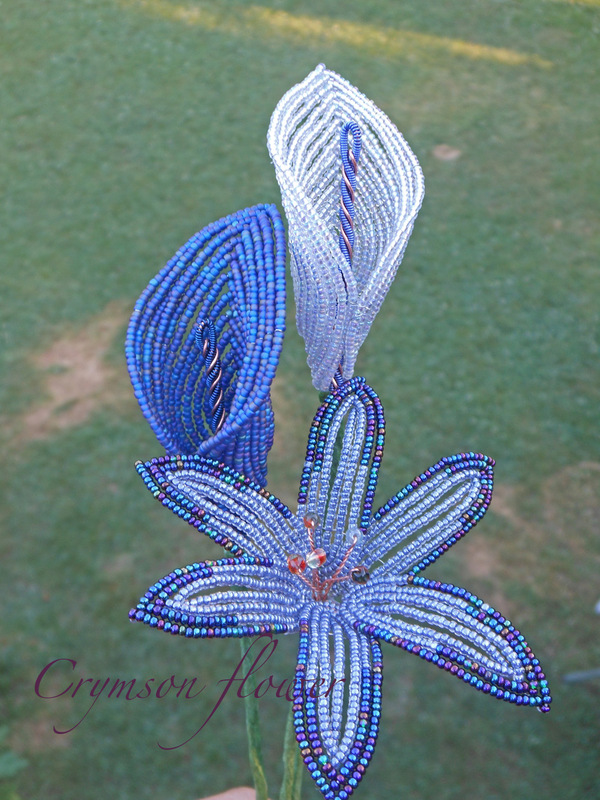 Sit in the sun or under the umbrella and see my beads in true day light. I have a quiet back yard when R isn't running around in it. It's peaceful and I get lots of work done there. This weekend we camped out in the backyard. R caught his first lighting bugs, had his first smore, and camped under the stars (in a tent w/ the fly off). It was a fun filled night. The rest of the weekend we spent going on massive hikes. Cooking great healthy foods. And we played in the pool a lot. In between all that I've been working. I'm staying up late each night and lacing and wire wrapping for his entire naps. I have 10 wine charm sets nearly completed. 3 wine vines that need wrapping. 3 laced lilies and one that needs lacing. 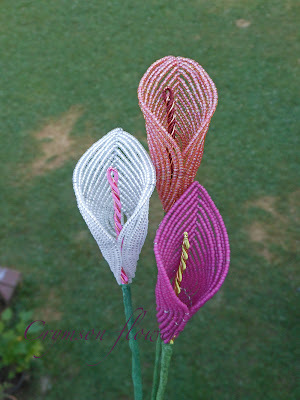 8 laced calla lilies that need centers. I want to make 3 more wine charm sets, and 3-4 more wine vines before next Sunday. 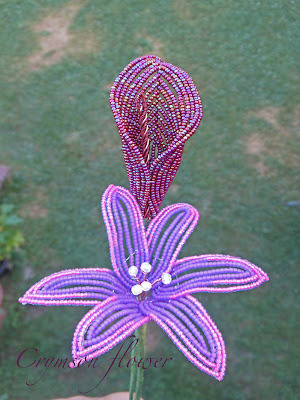 IF I were really lucky I'd also find time to make another purple rose. I get excited to pick up my beads in two ways. One is color inspiration and the second is shape. Color is by far the easiest for me to kick into gear. 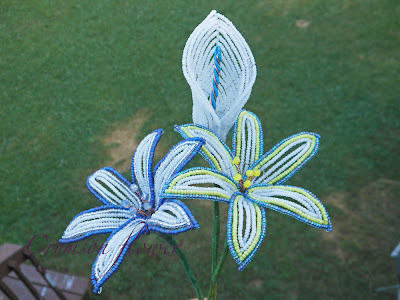 I can create a million lilies and still have fun changing colors. I love seeing how the different shades can play with each other. And whats even better about working with beads is that each color is available in at least 5 different finishes. Changing the finish of a bead and combining the finishes can create depth and texture. It will never get old for me. While it is easier for me to be inspired by color than by shape, inspiration can still be elusive at times. Like any other creative out there when I'm in a groove I've learned not to mess with it and just ride the wave. My unpredictable muse came to me this past weekend and has stuck around for a surprisingly long time. She's throwing both color and shape ideas into my head to meld and form amazing ideas. But they are all flower ideas. Flowers are my love, but they are not the priority for my business right now. So tonight I tempt fate and do the unthinkable. I will attempt to slightly nudge my muse into wine charm color inspirations. Perhaps if I am gentle enough and thankful enough for her presence she will hang around for a while yet. Wish me luck. I hadn't planned to take the week off. Ok, maybe I did plan to but then I decided I couldn't afford to take a week off. I had/have too much to do. So I took one day off. Which was great, but I was still tired. So I took another day off, and then the holiday weekend was here. So I took the week off. This long holiday weekend was more of vacation than Door County was in May. I feel so relaxed and re-energized. We hung out as a family. We watched fireworks, saw great friends, played in the kiddie pool, went on hikes and to the park. We were a family together an it was great. And then Friday night the beads started to flow. Colors came together faster than I could string the beads. Ideas for future flowers and colors popped into my head and I clung to them as I worked to finish what I had started before starting the next. And that flow kept flowing through Saturday and into today. Today I finished up the color combos I'd put together. Now as I'm writing this about 5 more ideas for flowers have come to me. Sunday night the final tally of petals of flowers completed equals, 4 lilies and 8 calla lilies. I went all out on the colors for new calla lilies. They were a bit of a hit at the show and I love how they look in clusters together. 8 seems like a lot but I'm a little addicted to making them so I can seem adding some teal and aqua callas to the pile. As well as some more white and neutral color callas. 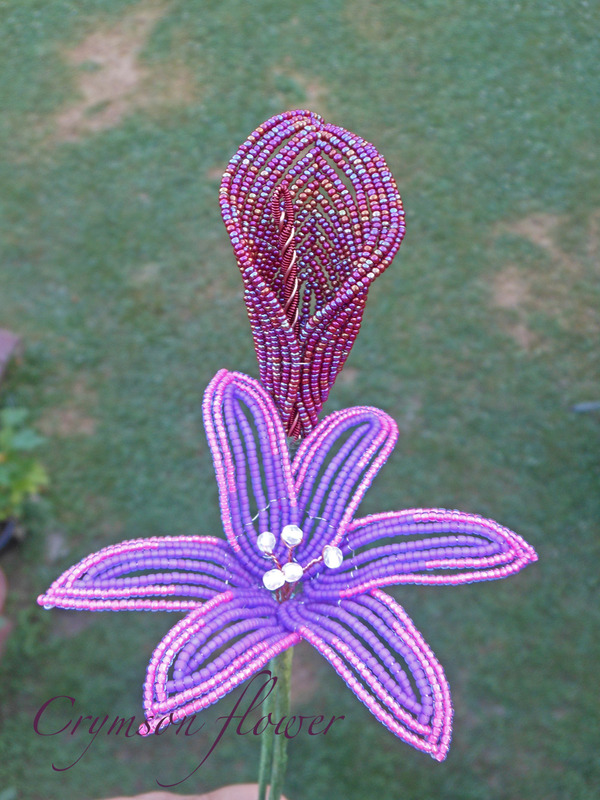 I'm also wanting to make a couple of the bigger flowers. Some more complex ones. Soon I need to focus on wine charms again. I'm very excited about starting up wine charms. I need to get all the flower inspiration out of me. Maybe lace some petals up. That's the plan right now at least. It's going to be a busy two weeks. This weekend was a whirlwind of everything and even after taking a day off I'm still trying to wrap my head around it. I want to officially thank everyone who sent me an email with booth tips and suggestions. I really appreciated the time you took to look and share your thoughts. I incorporated what I could in the time I had before the show and it made a HUGE difference in my booth. I had a very successful weekend and owe a good deal of that to you guys. THANKS!! I started my last blog post wondering if I was insane for committing to two shows in three days. And the answer is yeah maybe but it was worth it for the experience. C said insanity in moderation is the key, he's right. The trick is sticking with the moderation. Friday night was the Artists on the Boardwalk at Junction City. The pictures above and below are of my "booth" on the boardwalk. You can see me "in the zone" of setting up and arranging the flowers. You can see I added some purple table clothes/runners. I added some green fabric to the screen wall, and I painted the bottom slants in the wooden boxes. And you can't really see it but I had an artists bio sign hung on the screen wall as well. The Junction City show was a bit of a bust. Our spaces were moved down a bit and me and the artist next to me instead of being in a main spot we were more off the beaten path. Most people that were there were more there for the kid entertainment. Not so much there for the art. The Rhapsody in Bloom at the Luthy Botanic Gardens was a better show. I was very intimidated since it was my first two day show. First time I'd use my canopy and leave it there over night. And I had no idea what kind of turn out the show would have. I learned so much at this show. I learned that the hour or two before I leave to go set up a show is really the worst. Nerves take over and I'm restless and tend to pace. Once I'm there setting up and things are going then I'm fine. I learned that my canopy can hold out against both sprinkles and a pretty decent downpour. Saturday threatened rain most of the afternoon. So for the morning hours we had a steady stream of people come through. I was near one of the entrances which was a nice location. I had lots of compliments and even sold a couple flowers during the morning. Once 12 hit it started spitting rain now and then. The steady stream of people slowed down, and then right when it was starting to pick up again it really started to rain. Mom was with me both Friday and Saturday and we were able to get the wall down fast so that not much got wet. There wasn't any pooling of water on the canopy so that was a relief. After a half hour of rain it did start to soak through a little bit and drip down but it was minimal. I might need to spray some scotch guard the canopy and maybe get some seam sealer to help prevent leaks and drips in the future. I learned that I need to really zip tie down my screen wall. We had some decent breezes so the screen wall took a tumble. After that I both string tied and zip tied it to the frame of the canopy. So if it were to fall again it would take the canopy with it. We held up really well with the wind. But I was nervous about it all weekend. I learned that customers are not predictable. I was perfectly content with the couple sales I made Saturday morning. I expected very low crowds on Sunday and had made my peace with it. Sunday was booming. Busy from the doors opening until about a half hour before close. I had all but given up on my wine charms. They get lots of looks but no one really seemed interested in them...until Sunday. They were popular. Most people buying them as gifts, which worked out nice since I'd brought boxes to package them in. People seemed to really appreciate that. I learned that to my shock my newest bracelet, (haven't shared w/ you yet but will soon), is very popular. And the people who enjoyed my flowers very much enjoyed my bracelet. One even asked if I would have them at my next show! Guess I need to start hammering out the kinks on that. Finally, I've come to the conclusion that nothing is predictable in the realm of art shows. From the weather to the customers, to where your booth is in the park. Everything will affect and doesn't affect how the day will go and there is nothing you can really do about it except take the gamble. This weekend it was fun. A wonderful challenge, filled with lots learned, and positive feedback. My big plans for July have completely changed. 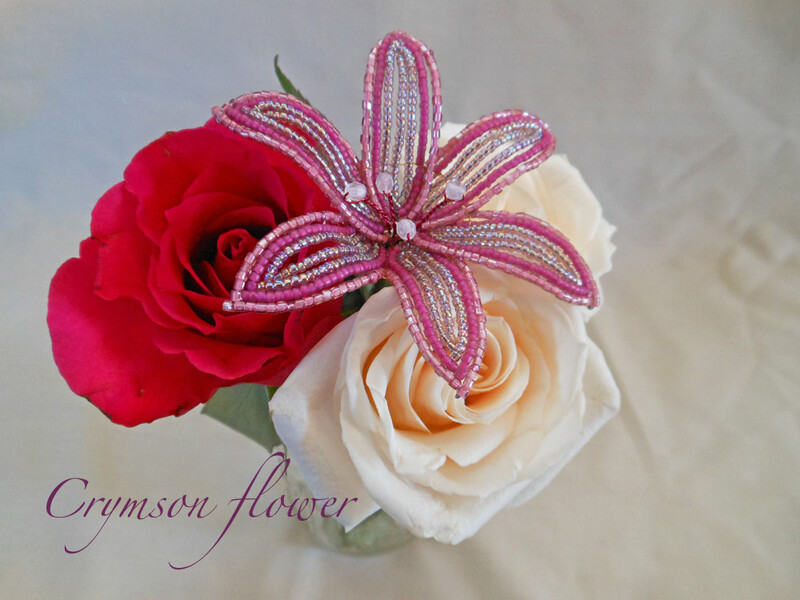 I had planned to focus on my etsy shop, rephotographing and tagging and relisting flowers. Making more inventory and promoting my shop. Now I need to more focus on inventory for my July shows. More wine charms, more flowers in purples, and in every shape. And I'm inspired about my bracelets. So I'd like to play around with some new ideas I have there.